Carolyn Elefant is the renown publisher of the My Shingle blog that assists attorneys in the solo practice of law, among her other many endeavors. But, My Shingle is and has been a product of love to help aspiring solos since 2002. She is also the author of a new book entitled Solo by Choice. It is a detailed road map, and really an inspirational road map, for anybody who wants to succeed in the solo practice of law. I would think it is a must read either wanting to or needing to take this journey. There does not seem to be a detail or consideration not covered. When I graduated from law school we had Jay Foonberg's How to State & Build a Law Practice, which was broader in scope in many ways. But, Solo by Choice seems to be the guide for the new ages. It is heavily steeped on example and in the new trends. The theme of the book is as stated in the title. 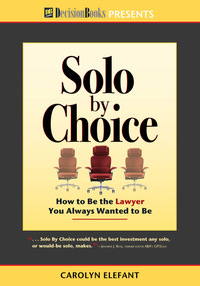 The act of going into the solo practice of law is a choice. Sometimes it is a Hobson's choice, but it is a choice nonetheless. Sometimes going into the solo practice of law is derived from a great desire, the need for autonomy, the need for flexibility or, as Carolyn defines it, "to own your own talent". But, it can also be because you are simply not happy in your Big Law environment, or your Big Law environment is not happy with you. Despite your desires otherwise, your responsibilities might not let you wonder too far from home. Maybe you need to earn more money, or it might be that you just cannot find an acceptable job, with an established lawyer, doing what it is you want to do. No matter what the reason the choice has been made, the impetus of the choice does not matter. We solos are all in the same boat, and you had better make the best of it. The premise of the book is to help you make the best of your decision from the perspective of somebody, as is Carolyn, that knows. I resemble these remarks. When I graduated from law school I moved back to my hometown of Texarkana. There were not a lot of larger firms and the few that existed certainly did not want to hire me. So, my choice was to nail my own shingle to a old building and call myself open for business. Some people have choices, but they feel they need autonomy. My Dad, for example, spent four years in the Air Force returning payment for the government's help in paying for part of his medical school training. He was a part of the aerospace medical program of that time. My Dad is a great eye surgeon but he has a little bit of a problem with authority. Not good for an officer in the Air Force. I remember my friends talking about their Dad's ranks in the military. I asked my Dad, "what were you in the Air Force." He responded, "miserable". My Dad needed his autonomy and that is okay. I think it is best if you can understand your needs and adjust yourself to suit them. That is what my Dad did. Really, that is what I have done. If you do this you will be happier in your work. In many cases you will find you will be happier in the solo practice of law. I can tell you that I personally like the flexibility of working as I do. That is not the biggest factor for me, but it is a big factor. A trivial example is that on many Friday mornings I like to sneak out with my wife (a/k/a my "girlfriend") to a movie matinée. We can go to the cheap feature in the morning and still be back in the afternoon to stomp out any fires that arose during our absence. My wife and I are constantly asking other lawyer's with firms that refer us cases to join us, but they never are able. They cannot bring themselves to ask their boss or partner or explain to their staff they are going to a movie in the middle of a work day. If you find yourself, for any reason, with the desire or need to go solo, you need to read Solo by Choice first. I will try to report more on this book in future posts. After reading so much about Carolyn's new book on various blogs and lists, I finally caved and ordered it. Can't wait to read it!